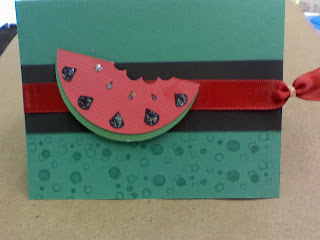 Create Embellish Adore: Summer time = Watermelon time! Summer time = Watermelon time! Finally the sun decided to shine and its been nice. I have enjoyed seeing what the sun looked like again. Its been a while since its shown its face! I was starting to worry since my garden needs some sunshine to grow, but without a doubt I am sure in a few days I will have to pull the hose over to the garden and have to water. 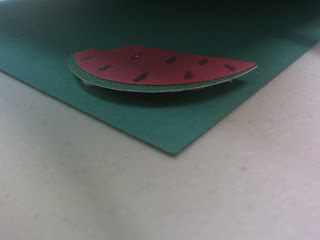 But in the meantime, I found a great deal on watermelon and was cutting it down to bite sizes when it dawned on me.. A WATERMELON.. that represents summer... so after I consumed almost half of the seedless watermelon, I hurried to the craft room and attempted to put one together. Afterall, its WATER and a MELON, it cannot be that bad for you- now can it? Happy Summer!